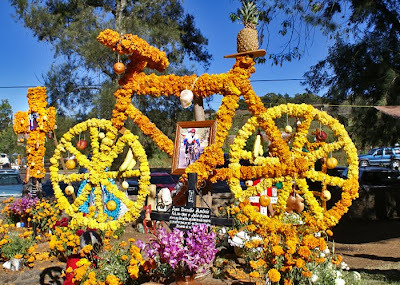 The relationship between bicyclists and cemeteries is a varied and often contentious one. On one extreme, bicycling is prohibited in National Cemeteries. This restriction has prompted protests from both visitors and commuters, but is supported by many people as well. 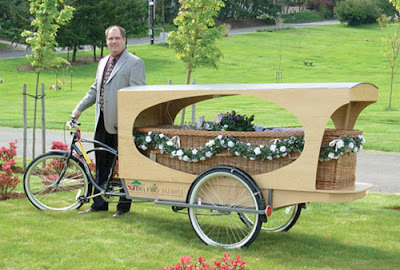 On the other end of the spectrum, Sunset Hill Cemetery in Eugene, Oregon offers the use of a bicycle hearse, allowing for meaningful and carbon free transportation of the deceased to their place of rest. The recreational nature of bicycling is considered to be disrespectful to the solemnity of the cemetery, military rites, committal services and grieving families by the Veterans Administration. Also prohibited at National Cemeteries are jogging and picnicking. Along with automobiles, bicycles are often prohibited from using National Cemetery roads for transit. The VA states that in order to accommodate the high volume of funeral processions, all vehicles not involved in processions must be parked at the cemetery entrance. This restriction has rankled bicyclists from Arlington to Santa Monica who wish to bike in and through National Cemeteries for recreational use, and for safety in commuting. The concern for supporters of this restriction is that the specialness of the cemetery will be lost. That National Cemeteries will become no different from National Parks, with barbecues and Frisbee games taking place among the headstones. Proponents of the restrictions fear a slippery slope leading to highways running through sacred ground, disrupting the respectful rites and deeply emotional services which are the purpose of the cemetery. At the other side of the continuum, many cemeteries not only allow, but encourage bicycle traffic. The administrators of these cemeteries argue that the more a community is involved in its cemetery, the more they appreciate the beauty and historical significance of the space. As communities become involved, they develop a sense of 'ownership', a desire to keep up and protect the space, and are more likely to choose interment there for themselves and their family members. 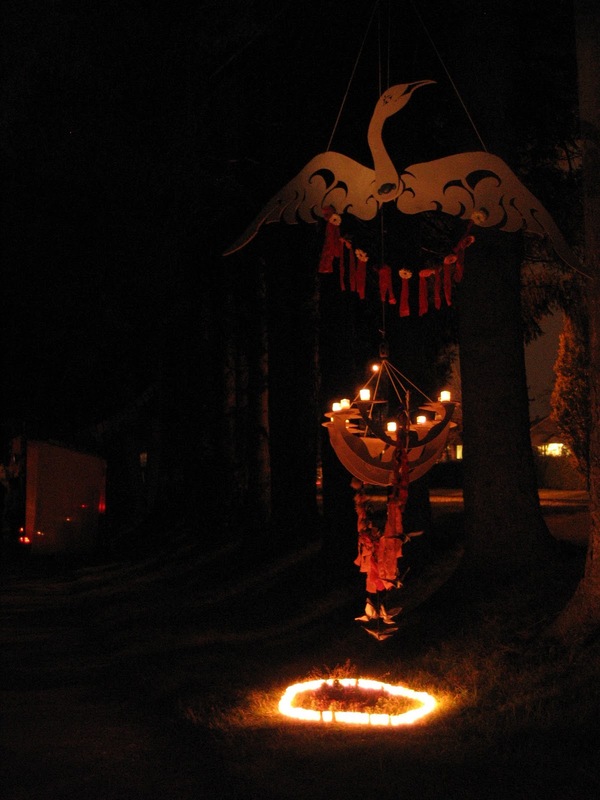 Not only are bicycle paths encouraged; bird watching is facilitated, religious and ethnic festivals are held and tours, film festivals, and concerts are taking place in cemeteries all over North America. Unfortunately, in recent years cemeteries have lost much of the relevance they once had. Cemeteries are more and more often seen as a waste of space, or a gloomy reminder of our inconvenient mortality. For many, they are not a desirable place to visit, much less rest forever. People choose to cremate and scatter in a place that reminds them of life and the spirit of the deceased, rather than bury in a cemetery. 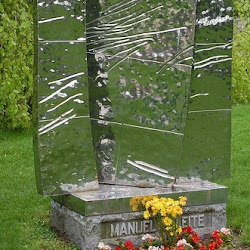 Often the unintended consequence of scattering is that mourners have no special place to visit their loved ones; no place to go to share an achievement or setback with their loved one, no place to go to include their loved one in holiday traditions, to continue a very real and important relationship. Some cemeteries have made great strides to change their environments and burial options to suit these changing tastes, but many traditional cemeteries already have wonderful and desirable features to enjoy - if only the public would take the time to explore them. This is why cemeteries must allow the activities of life to have a place among the dead. 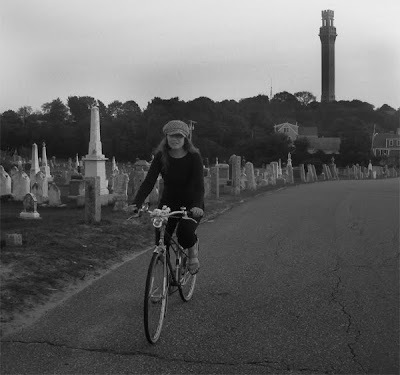 Riding a bike through a Provincetown, Mass Cemetery from A Lovely Bicycle! ... I present you also with this photo of me and Marianne cycling through Provincetown Cemetery at dusk. I spent part of my childhood in a small New England town, where we lived down the street from a very old graveyard. 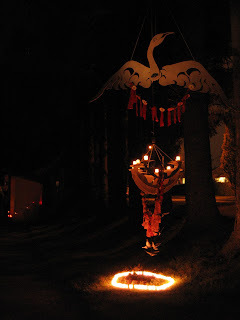 Its presence seemed entirely normal; my friends and I would even take walks there after dark. Only later did I discover that graveyards freaked other people out. That and old Victorian houses with floorboards that creak even when no one is walking on them. Go figure! 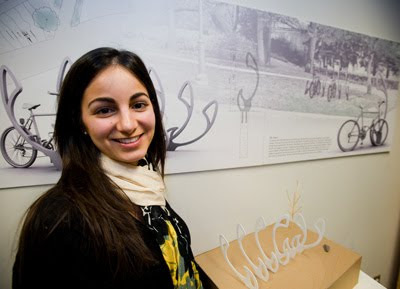 Third-year interior design student Katy Alter won first place, with her partner Jeff Cogliati, master of architecture, in the Mount Pleasant Cemetery bike rack competition. Students were asked to create specially-designed bicycle racks for Toronto's historic Mount Pleasant Cemetery. The idea is that the racks will enhance the bicycle-friendly environment that exists within the Mount Pleasant grounds. Andrew Furman selected seven third- and fourth-year students in his interior design course to take on the challenge, letting them choose teammates from any discipline across the university. The first place prize of $3,000 went to Katy Alter, third-year interior design, and her partner Jeff Cogliati, master of architecture. Alter and Cogliati designed "The Lotus," a dynamic, functional and sculptured bike rack that's practical in purpose but artistic in vision as well. They chose the lotus flower because it symbolizes regeneration and the continuing cycle of life. "We wanted to create something that blended in with the cemetery and was sensitive to the surroundings," Alter said. The design jury was chaired by Ryerson alumna and renowned landscape architect Janet Rosenberg and included Daniel Doz, dean, Faculty of Communication & Design; Andy Barrie, host of Metro Morning, CBC Radio; Christopher Hume, urban issues and architecture columnist, Toronto Star; and Glenn McClary, President and CEO, Mount Pleasant Group of Cemeteries. "When Mount Pleasant approached us about this unique challenge for our students, we were thrilled to be part of this opportunity," Doz said. "This kind of joint initiative speaks to so many aspects of what Ryerson is about - in particular, challenging our students with unique experiential learning opportunities in engaging with our community." The winning team will begin to produce their prototype in April. This photo from GroovyGreen.com shows Wade Lind, the owner of Sunset Hills Cemetery in Eugene Oregon with his Bicycle Hearse. Inside the hearse is a 'green casket' made of renewable. biodegradable and lightweight materials. This hearse would conceivably be allowed within National Cemeteries as it serves a very real, as well as symbolic purpose in the funeral rites and procession! Activities in cemeteries need to be circumscribed out of respect to their residents, and to remain special and peaceful places for communion and contemplation. However, there is a danger in restricting too much of life's activities within the cemetery walls. Only by opening them up to life, will cemeteries be appreciated, valued and relevant to the needs of the communities they serve. It is my hope that cemeterians will continue to find innovative ways to welcome the life of the community into the cemetery, and that our communities will once again realize how much cemeteries have to offer. 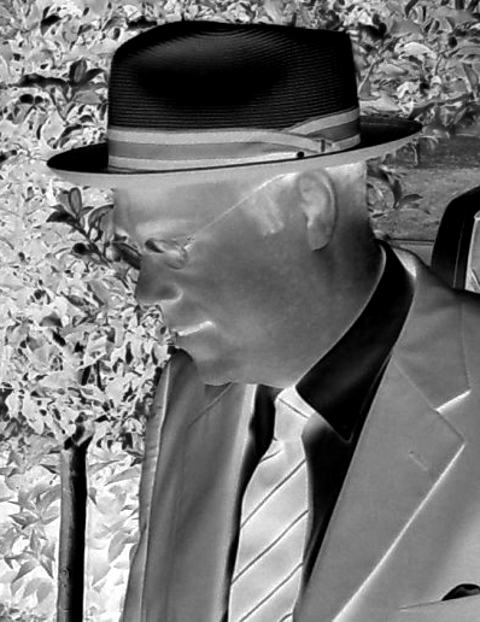 ANTIVIEW, a project by Australian journalist Max Opray, frames interview in a negative perspective. According to Opray, it was " born from the death of the interview. When journalists stopped asking new questions, and interviewees stopped answering from the heart. For a long time now, most interviews involve the same set of questions to the same type of celebrities, who regurgitate the same stale answers again, and again, and again. So, what if instead of asking people who they are, someone asks who they aren’t? What kind of answers would people give? And what would we learn about them from who they don’t think they are? And so Antiview was created. The one rule is that every question has to be negatively-framed: How wouldn’t you describe yourself? What doesn’t motivate you? 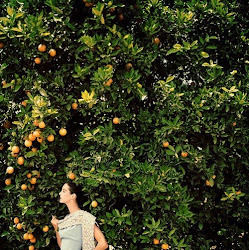 If you were stranded on a desert island, what three things wouldn’t you bring? In the same spirit, Antiguides explain how not to do something, while Antiquotes offer wisdom in a negatively-framed form." My Friend Mott-ly is a project near and dear to my heart. This documentary, by Chris Snipes, tells the story of Lee 'Mott-ly' Tisdale. 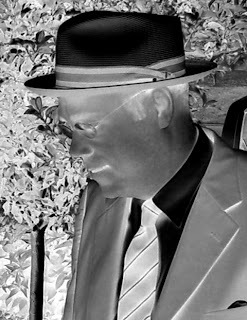 Mott-ly was a dear friend and a talented artist, whose courage and vision shone through his devastating illnesses. 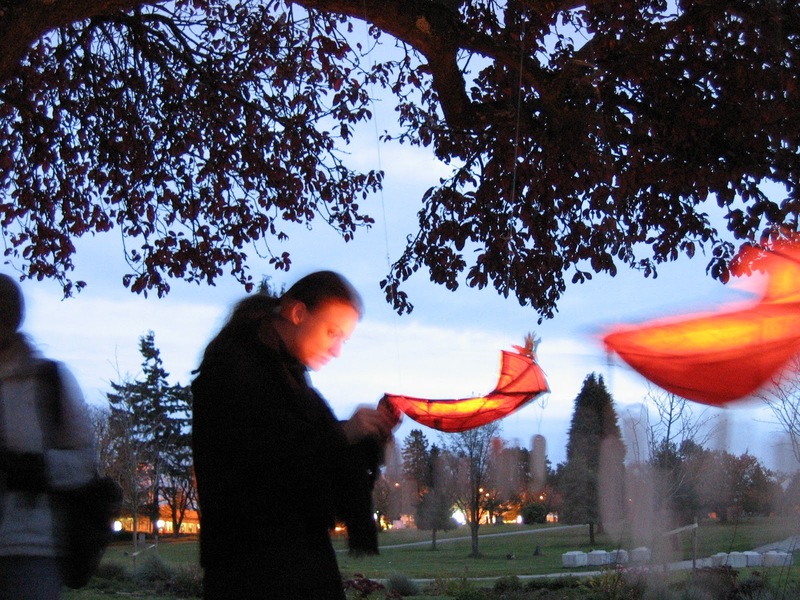 Pat McNally: In your work with A Night for All Souls, you have created and facilitated many wonderful ceremonies and rituals acknowledging our dead and the loss we experience in their passing. What specific personal and community needs does this festival address? Paula Jardine: The Night for All Souls grew out of work I had been doing with Marina Szijarto- who I work with closely on this event. Really what we were trying to do was reclaim traditions that our own ancestors seemed to have forgotten to pass on to us. 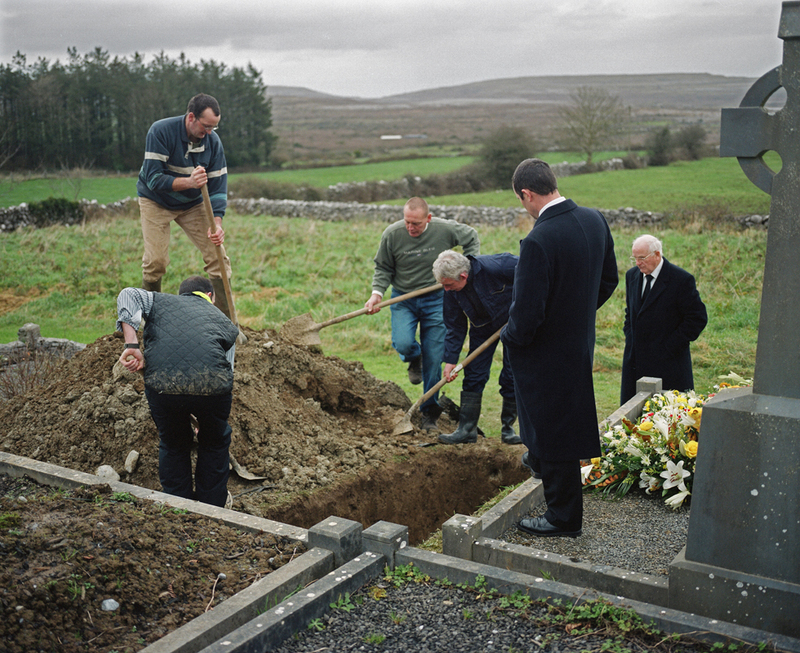 We may not live in the village where our ancestors are buried, but that human impulse to remember the dead – as a way of keeping them in our lives – is still there. It seemed to us that artists have an important role to play in the sacred life of our increasingly secular society: that even if someone is not religious it doesn’t mean they don’t have spiritual needs. The biggest gift of the night for all souls is I think the social aspect; except at funerals or memorials, we do not invite conversation about death and it’s presence in our lives. At this event, we are surrounded by people who, simply by being present, have acknowledged that they share that experience. People create memorial shrines, or write messages and names on prayer flags, or the memorial triptych that Marina has created, and we can see that we are not alone. We inspire each other with our words, and with the beauty of our creations. It is a very supportive environment- not somber, but definitely caring and gentle. PM: One of the really remarkable and inspiring parts of A night for All Souls is that many different cultures, faiths and traditions are incorporated and welcomed. Is there something universal that we can all relate to in this? Could this be a model for how we engage and relate to others? PJ: Well death is definitely something that all cultures share! I believe that culture is a living thing, not static; by bringing our own traditions and sharing them, we influence each other and something new is made. It’s something that may be truly Canadian, that willingness to share culture and allow it to transform to meet our needs. We chose this time of year because it is traditional in so many northern hemisphere traditions, all soul’s, all hallows eve, Celtic New Year. And there was also discussion about how “under siege” the cemetery is around Hallowe’en, and a sense that by reinforcing the sacred nature of the cemetery it would make it safer. We initially thought this event would appeal to people without a strong cultural or religious tradition, but we are finding that many religious people of different backgrounds also come: perhaps death, being the great equalizer, is also the light of truth, that is, it illuminates the central tenant of all the religions, which is Love. PM: Children experience death just as the rest of us do, but they often lack the communication skills and perspective that can help adults share and move through their grief. What can an experience like participating in All Souls give to children? PJ: I think it has a normalizing effect. We were just talking about that at our Sugar Skulls workshop (another borrowed tradition that people have been making their own) and how having a traditional time set aside to talk about death, and those who have come before us, creates an opportunity for children to understand that they are part of a continuum, and that death is a natural part of life. Importantly, it introduces children to the idea of death when it is not a calamity. We have beautiful paper and votive candles and flowers for the creation of personal memorials at the event as well, and we’ve found we don’t have to explain that to children, in fact they seem to inspire the adults. 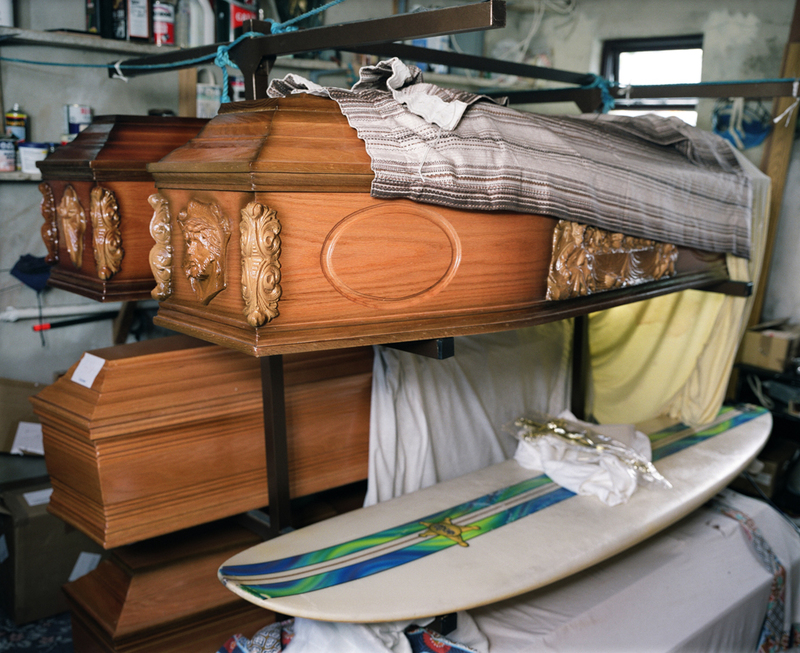 PM: The intersection of Art and Death is a major theme on The Daily Undertaker. What are your thoughts about the role of art in grasping and dealing with the sometimes overwhelming and unknowable reality of our mortality? PJ: Art allows us an opportunity to disengage our rational mind and swim in the poetic. The expression of our feelings through art can be therapeutic both for the creator and the viewer; simple gestures can be cathartic and help us heal. One year artist Nicole Dextras created a memorial to a friend with ice letters: the letters melted throughout the evening as a visible expression of the impermanence of our own lives; another artist created a wooden ship that was also a flying phoenix, to carry the memory of her father: the works of the artists who create things for all souls uplift us all to greater heights of beauty and expression. PM: Throughout human existence, the places of the dead and the places of the living have alternately been shared and separate. 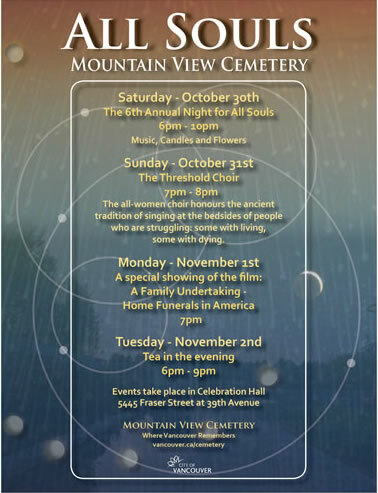 In bringing the living into Mountain View Cemetery through arts and cultural events, our perception of these places, and our place within them changes. What are your thoughts on the separation and bringing together of these two worlds? PM: What do you think our culture would look like if more artists were engaged to be civil servants? PJ: Artists are creative problem solvers; I do actually think that it should be policy to have an artist on every team within the city structure, especially in engineering. There would be less emphasis on doing things for purely practical reasons, so there would be more whimsy. We might have more beauty in general, and roads might be less straight (or maybe they would be invisible!) And artists know how to stretch a dollar, that’s for sure, so we might even have less debt load! who are struggling: some with living, some with dying. 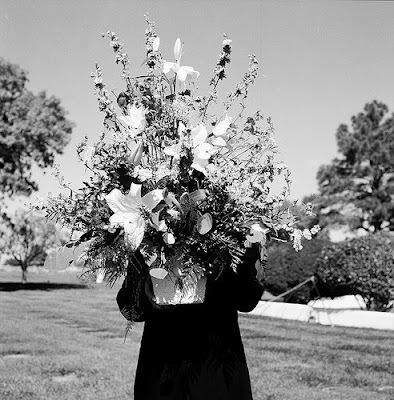 A director I used to work with always said 'flowers are the bain of the funeral director's existence'. 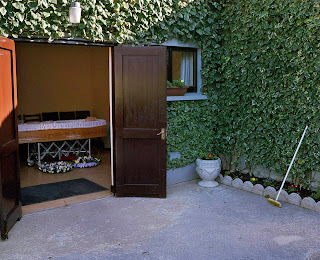 Indeed, we spend a lot of our time arranging flowers at the chapel for visitation, then moving them to church for the service, then, taking some to the grave, some to the home, some to this nursing home and that hospice. 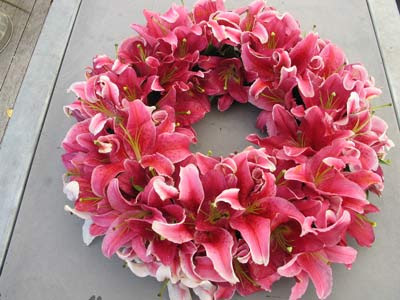 In the cold weather we have to wrap and unwrap the flowers and plants with plastic so they don't wither away. 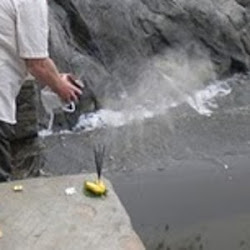 Pollen satins our white shirts, petals fall and stinky water spills all over in the vehicles. I almost lost a finger in a flower stand accident! Well, I'm all for donating to worthy charities, and I won't mind only moving five pieces of flowers to church tomorrow, but when I die, I'd like my obituary to read 'In lieu of memorials, please send flowers'. Flowers are a visible expression for a grieving family that their friends and family and neighbors and coworkers care and are thinking of them in their loss. When a family comes in before their visitation, the first thing they do after weeping at the casket is look at all the flowers and say 'isn't that nice, aren't these beautiful, look these are from my job! these are from our neighbor!' When they come into the chapel for the service, again there is the visual reminder of all the people who may not have the words to make things any better, but have shown by their actions that this person and this loss are meaningful. Whatever the cost of the flowers, and whatever is done with them afterwards-they made a difference to that family. What makes a funeral or memorial service meaningful? What makes a tribute fitting and moving? This is an issue that has been of great concern to caring funeral directors for many years now, as we strive to meet the changing needs of families. Many different products have come along from candles to casket corners to photo slideshows and dove releases, all offering an opportunity to personalize the funeral experience. These products can be meaningful for some families, but they have a tendency of becoming just one more cookie cutter. In my professional opinion, creating a meaningful and fitting tribute involves a lot of listening, responding creatively, and enlisting the participation of family and friends. 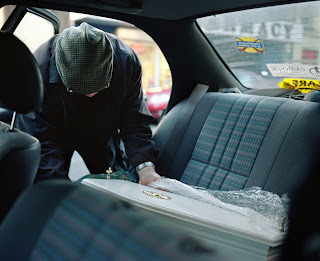 A loving and meaningful expression by the survivors is facilitated, not just sold, and the value of the funeral director is his or her ability to offer experience and ideas, not just products. 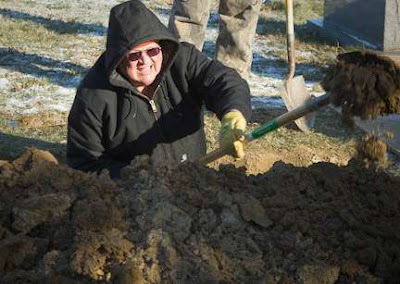 A wonderful example of a meaningful tribute comes to us from Shiloh, Ohio, where friends got together in bitter cold temperatures to dig by hand, the grave of retired sexton Pete Ferrell. 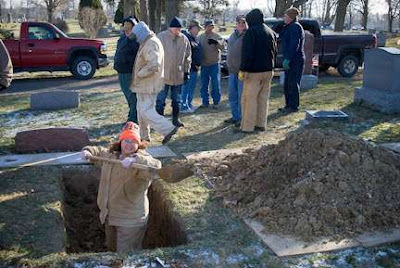 Mr. Ferrell was a friendly giving man who dug hundreds and hundreds of graves by hand over his 50 year career. Even after the use of modern excavating equipment became common, he insisted on digging by hand because he thought it was a better method. The tribute is appropriate to Mr. Farrell's life, work and personality. The participation of his friends makes it an act of love, and a healing and uplifting experience for them. 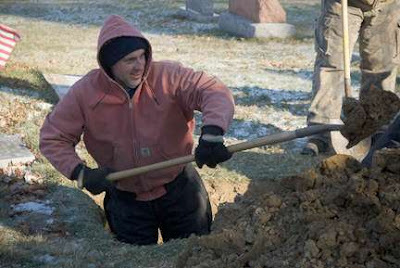 How often do you see people digging a grave by hand in frigid temperatures with big smiles on their faces? These people will never forget their experience. They have acknowledged the reality of the situation, and fully embraced an active role in respectfully laying their friend to rest. Mr. Ferrell would surely be proud, and the survivors have worked through their grief in a positive way. 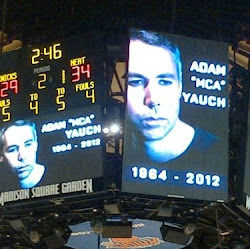 That's what makes a fitting tribute. 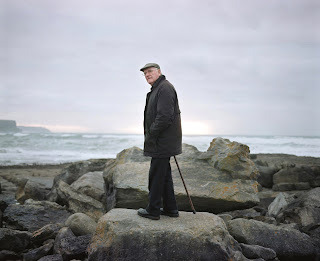 Irish photographer Kenneth O'Halloran's series "Life after Death" focuses on the artist's father, an aging undertaker. Like many Irish undertakers, and the undertakers of Americas past, the elder O'Halloran's livelihood was supplemented by plying another trade. In his case it was a drapery shop. In the case of my great grandfather, a second generation Irish American in late 19th Century Iowa, it was a hardware store. 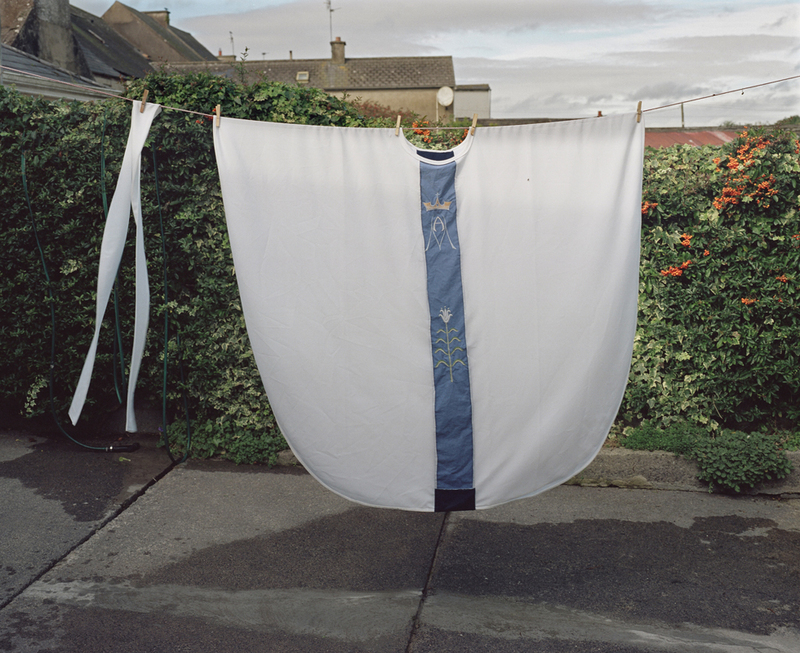 O'Halloran's portrayal of death within the context of ordinary life, both touching and mundane, provides us with a perspective that has been lost in modern America. These fascinating photos are made even more moving by the undeniable undercurrent of the Undertaker O'Halloran's advancing age and inevitable passing. My thanks to Kenneth for his kind permission in allowing me to share these images, and his words with my readers, all of which is his copyrighted property. Enjoy, and please visit the Kenneth O'Halloran web site for more of this compelling work. 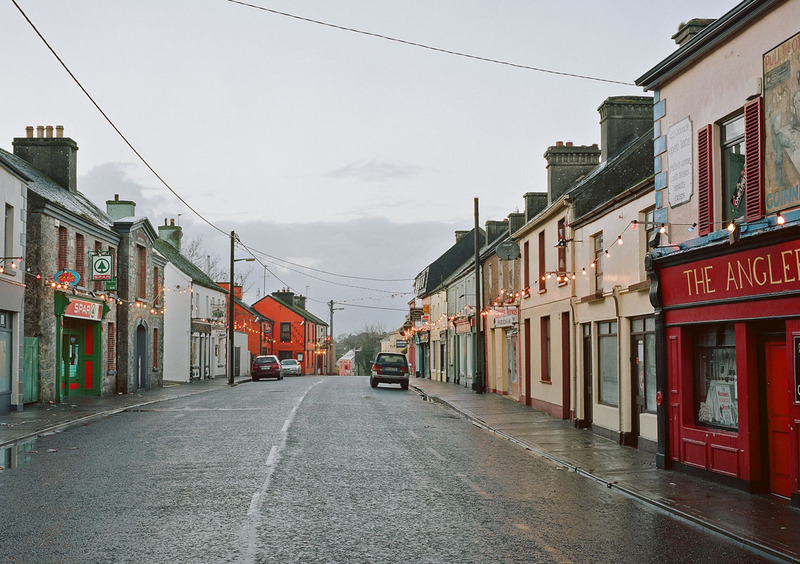 "Though now a more secular society, Ireland still has remnants and relics of the old religious faith, even if many of its devoted followers are typically advanced in age - part of what might be termed a dying generation. The Catholic Church had been one of the country's mainstays. Falling Mass attendances, declining priest numbers and various damaging scandals have shaken the institution and weakened its grip. 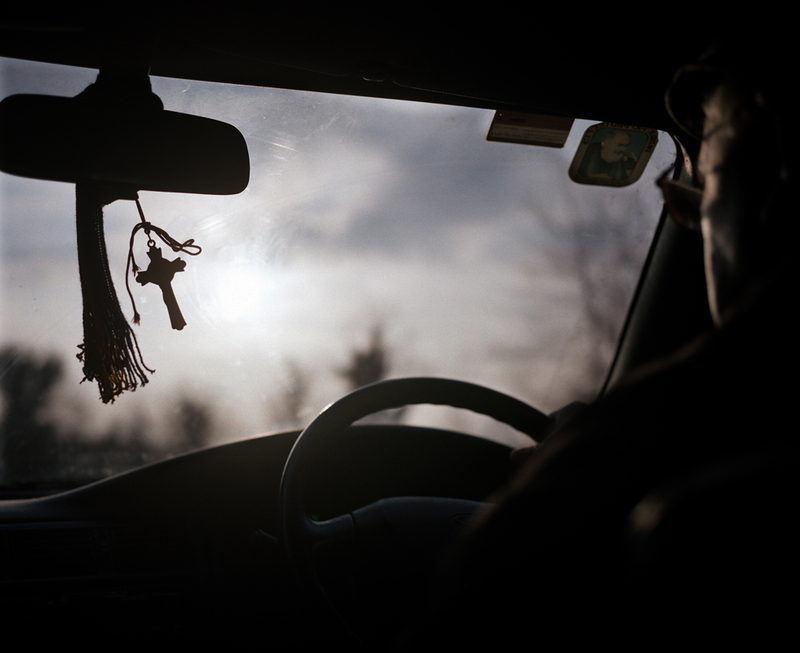 Despite this my father is a daily Mass-goer; his faith doesn't appear to have flinched." 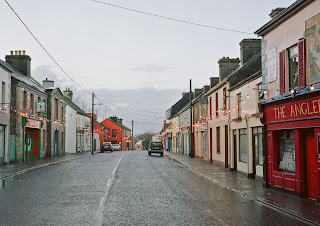 "The house where I grew up in the west of Ireland is where my father now resides with his wife and their daughter Susan; all the rest of the family have flown the nest, some starting families of their own, one in New York where she has become part of the Irish Diaspora. The religious paraphernalia located throughout this house gives God a central presence and status not uncommon in Ireland at the time. We prayed as a family, like when the Angelus bells struck at noon and six in the evening. We knelt at night to say the Holy Rosary. Many of our rites of passage as children were rooted in Catholicism - our first communion, our confirmation, and so on." 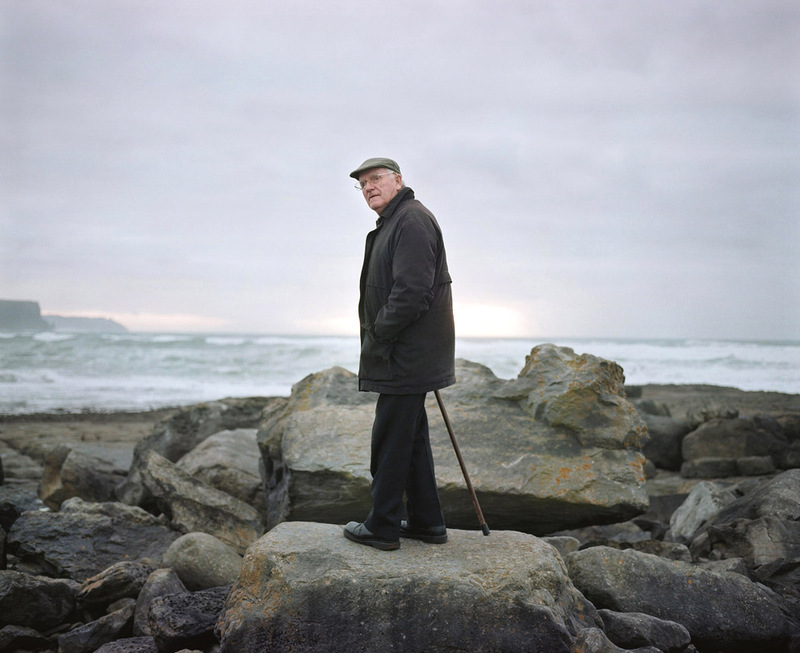 "My father, who is 80, would not have seen anything remarkable in this. He was merely carrying on the tradition of his own father's generation. 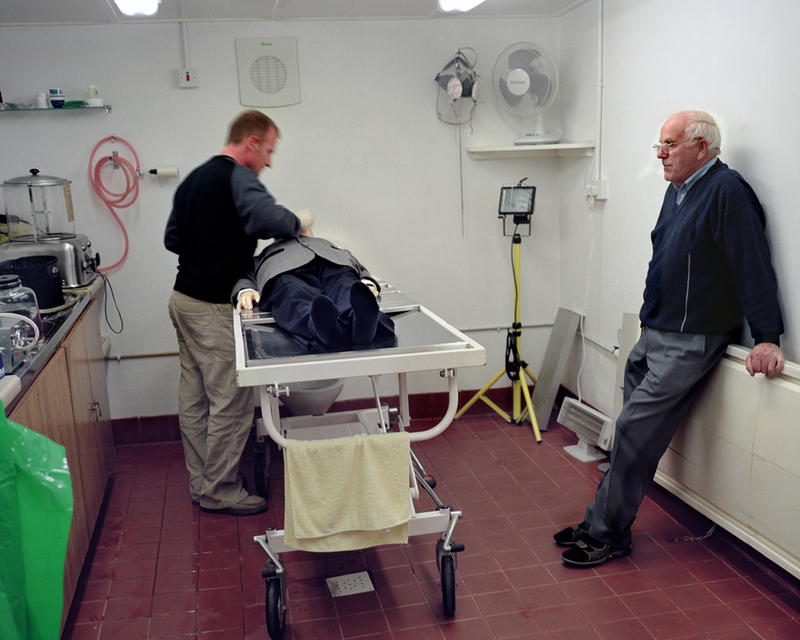 Having spent half his life working, he recently retired, closing his drapery store. His undertaker's business continues. For me and others in the family it meant that death was never far away or overtly mysterious. 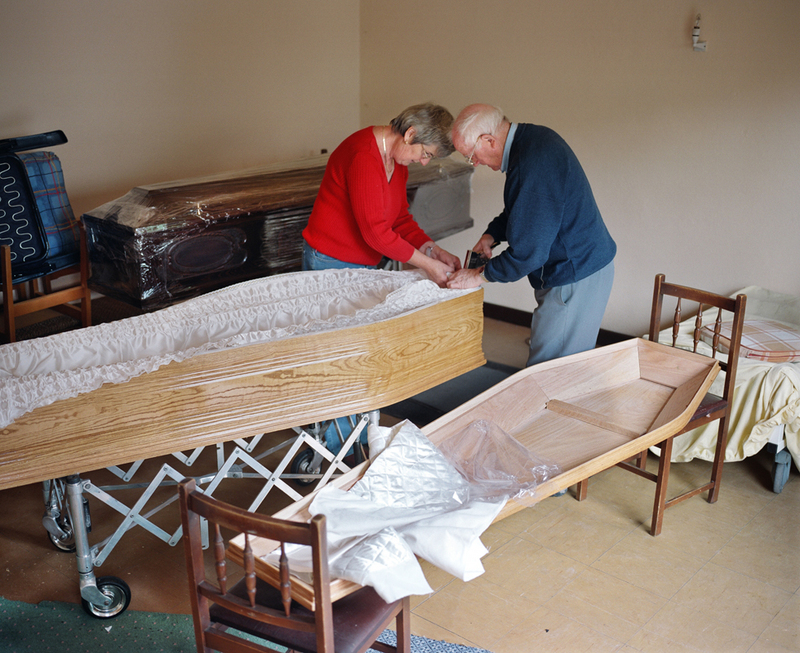 We became accustomed to the dead of our parish being prepared for the final ceremonies before burial. 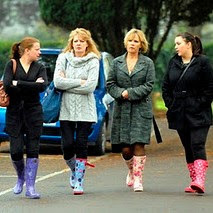 We would often come home from school to see who had died that day." "If we truly wanted to make our father proud, we would have mastered the game he followed all his life: hurling. 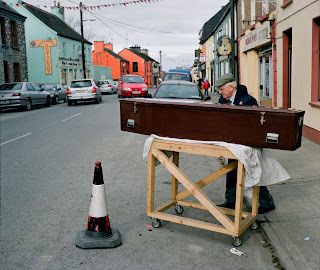 This ancient Irish sport, requiring great dexterity, courage and speed, can still weave a spell on him. 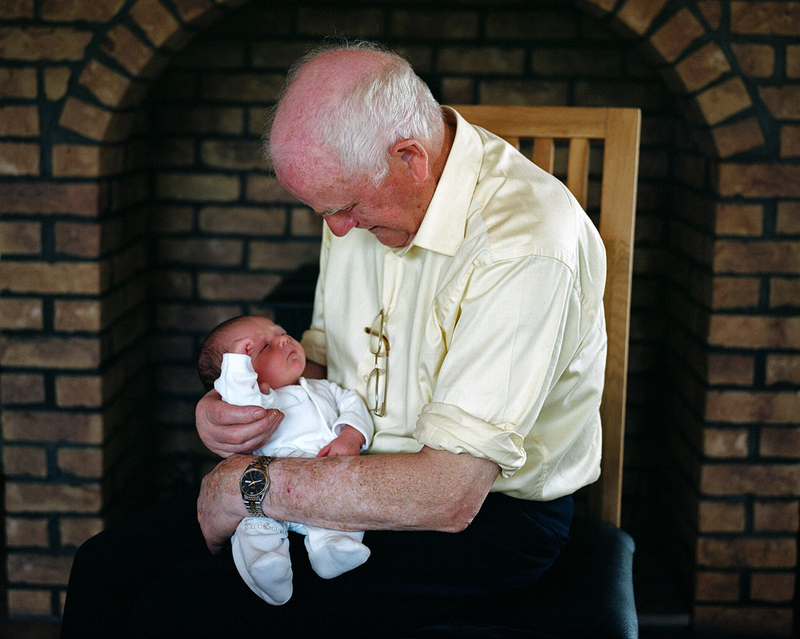 Born in a rural community he has seen his own life change and now that of his children too. In recent years he lost a brother to whom he was close. Now I see him deriving great joy from his grandchildren. In their company he seems tranquil. At peace. His work done." 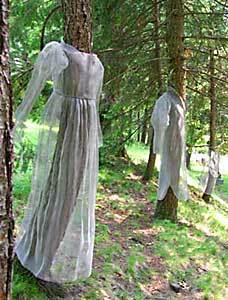 Promessa Organic AB of Sweden is developing a new method of disposition for the dead called 'promession'. Promession is described as an environmentally friendly form of burial, and could in fact be the greenest of green disposition options. 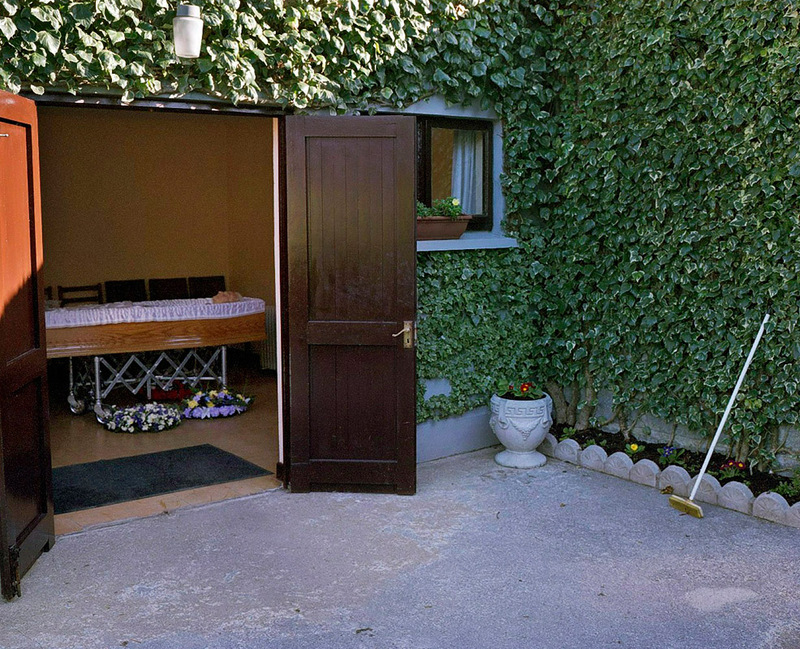 In addition to its green credentials, promession is offered as a more ethical option than cremation or burial. Susanne Wiigh-Mäsak, biologist and head of operations at Promessa Organic AB recently gave a very interesting and inspiring presentation at the 90th annual convention of the Cremation Association of North America (CANA) and agreed to discuss promession with me for this post. The process of promession involves a promator, freezing human remains in liquid nitrogen (a byproduct of the compressed oxygen produced already for medical purposes.) Once frozen, the casket and remains are agitated with a shaking motion from a table below them, causing them to shatter into tiny pieces. These pieces are then freeze dried to remove all the moisture from them. Metals are then separated, and after being laid in a biodegradable coffin can be buried, returning all the nutritious components to the soil. I asked Ms. Wiigh-Mäsak how she came to develop this process. 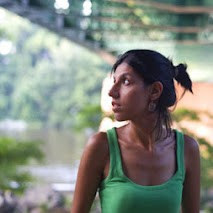 She is both a biologist, and an engineer, and has been keenly interested in gardening and science since youth. A special interest has been composting, and she is careful to point out the difference between decomposition and rotting. 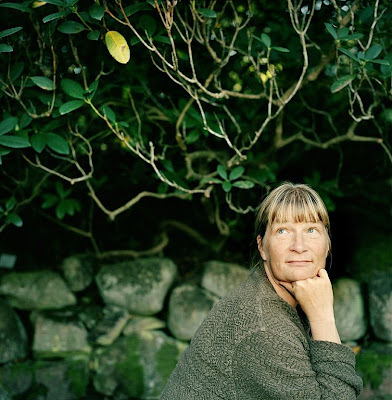 According to Ms.Wiigh-Mäsak, proper composting involves decomposition, which requires the same conditions that sustain life: air, proper moisture and proper temperature. These conditions allow for a substance to break down to the nutrient level that can replenish the earth's living soil, and are necessary for enzymes and microorganisms to do their work as well. 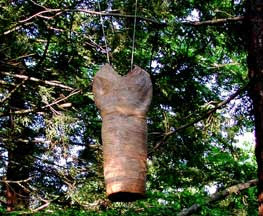 The alternative to decomposition, says Wiigh-Mäsak, is rotting. Rotting occurs when the remains are too large for the air and soil to act upon their surface readily enough to break down in a positive manner. In the case of rot, the body's substances return to the earth, but not in a form that is enriching and replenishing to the living soil. Because of her deep interest in composting, Ms. Wiigh-Mäsak was struck by the idea that kitchen scraps are treated with more reverence than the bodies of our loved ones. The nutrients of an apple core, that have been taken from the earth, can be returned to it through proper composting techniques, but the six and a half billion human bodies that have drawn life from the living soil are destined to burn off, rot away or lock away their nutrients, rather than return them in a positive way to the earth. 1. The corpse is frozen down to -18 °C. 2. 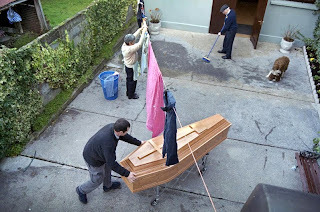 The coffin with the deceased is lowered into liquid nitrogen. The body becomes very firm and brittle. 3. The coffin and the body are exposed to a light vibration, disintegrating into dust. 4. Mercury and other metals are separated using an induced magnetic field. 5. 25 - 30 kg of the powder now remains. This is put into a coffin made from maize starch or potato starch. 6. The starch coffin is buried shallowly and will turn into compost in 6 - 12 months' time. A tree can be planted on the grave. It will then absorb the nutrients given off. 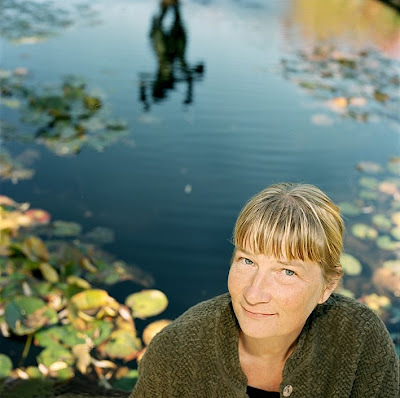 Combining her interests in biology and engineering Ms.Wiigh-Mäsak developed the promession concept. She argues that this process in essential for the health of the living soil as well as an appealing and respectful disposition of the dead. According to Ms. Wiigh-Mäsak, even direct burial in a shroud is not as positive for the earth because the mass of the body, and the amount of moisture left in it prevents proper decomposition and results in rotting. What is truly different about promession is the process whereby the body is broken down to a point where the proper composting and a positive return to the living soil is accomplished. Ms. Wiigh-Mäsak describes the actual physical process of promession to be something that is appealing to witness, a process that even a small child could watch and not be disturbed or frightened. So, how far away are we from having promession as an option to choose from? Promessa is currently preparing for operations in South Korea, where laws have been passed to allow for this form of disposition, and promession has been embraced by the Christian Church there. Sweden is also getting closer to allowing promession as an option. Leaders of many religious denominations have determined that promession is consistent with the tenets of their faith. As far as the future of promession in North America, laws must be passed to allow for promession, and Promessa is currently in the process of selecting licensees and promession providers. A cousin to the Roadside Memorial is the Ghost Bike, or Ghostcycle. Ghost Bikes are memorials to those killed while riding their bicycles, and are placed at the scene of the accident. Ghost Bikes began is St. Louis and have spread as both memorial and protest, all over the world. 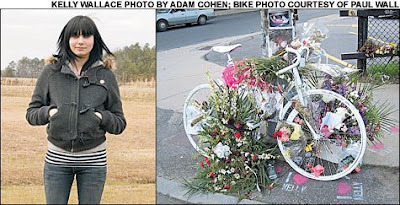 In June 2005, Kevin Caplicki was biking down Fifth Avenue in Park Slope when he came upon the body of cyclist Elizabeth Padilla, who, minutes before, had been killed by a delivery truck. Caplicki belonged to the street-art collective Visual Resistance, and at its next meeting, they decided to construct a memorial for Padilla. The group took a spare bike, painted it white, and chained it to a sign post near the accident. The installation no longer looked like a bicycle as much as the negative space where one should have been, as if it had been cut out of a photograph by an X-Acto knife. 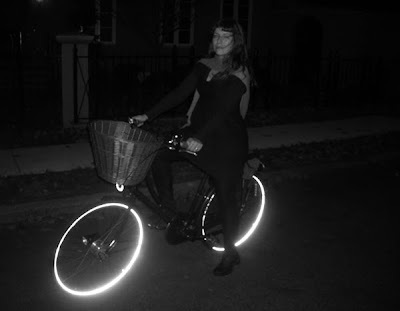 It became New York’s first Ghost Bike. There will be a memorial bike ride for Eric Ng, the cyclist killed by a drunk driver on the Hudson River Greenway last week. Details below. Also, here is a note from the Visual Resistance blog. VR are the guys who make the "ghost bikes:"
I've been making ghost bikes for strangers for a year and a half. Eric's is not the first that made me cry, but it's the first that made me hurt. A big group of Eric's friends spent the weekend mourning, talking, and, finally, making. We made a ghost bike for him on Saturday and sunflowers on Sunday. Eric's memorial plaque reads "Love & Rage” no resting in peace for this rock star. 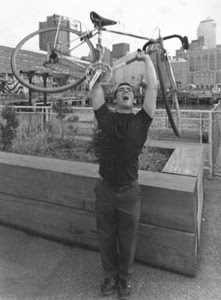 We are planning for a memorial ride this Saturday, December 9th, meeting at 1pm in Washington Square Park and then proceeding to the site of Eric's death. Non-bikers can head straight to the site, on the West Side bike path near Clarkson St. Please bring flowers (especially sunflowers), sidewalk chalk, paint, whatever you want. There will be a memorial service after the ride with music and a slideshow, and a party later that night. 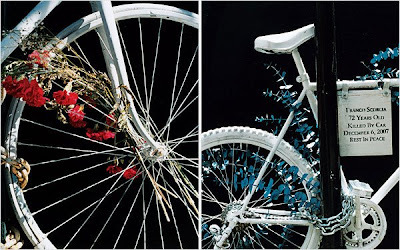 Ghost Bikes are small and somber memorials for bicyclists who are killed or hit on the street. 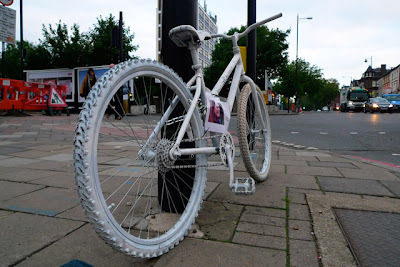 A bicycle is painted all white and locked to a street sign near the crash site, accompanied by a small plaque. They serve as reminders of the tragedy that took place on an otherwise anonymous street corner, and as quiet statements in support of cyclists' right to safe travel. This past Saturday, Cinespia kicked off their summertime movie screenings with the classic Hollywood musical, The Wizard of Oz. 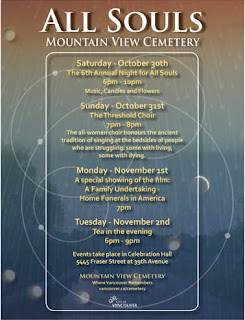 The screenings which occur on Saturdays (and some Sundays) during the summer, are held outdoors on the lawn of Hollywood Forever Cemetery. The cost is $10 and guests are encouraged to bring their own food and drinks. 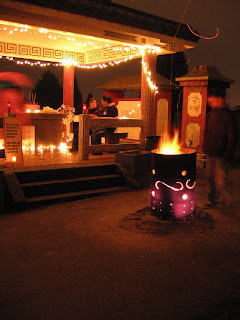 Forest Hills is one of Americas great historic cemeteries, as well as a leading innovator (In August, I wrote about their beautiful yearly lantern festival.) Long known for its important collection of Victorian Sculpture, the Trustees have created a Sculpture path for contemporary works. Artist Statement: An examination of how the places people dwell-both before and after death-reflect their lives and personalities. Cast concrete replicas of homes previously occupied by some of those interred at the cemetery are arrayed on a rock outcropping within the cemetery. The styles of the homes range from Queen Anne mansion to a modern split level. Each building has the occupation of the owner etched into it. Artist Statement: An outdoor exhibition space offers an opportunity to develop a dialogue between artwork and the environment that I find rewarding and challenging. 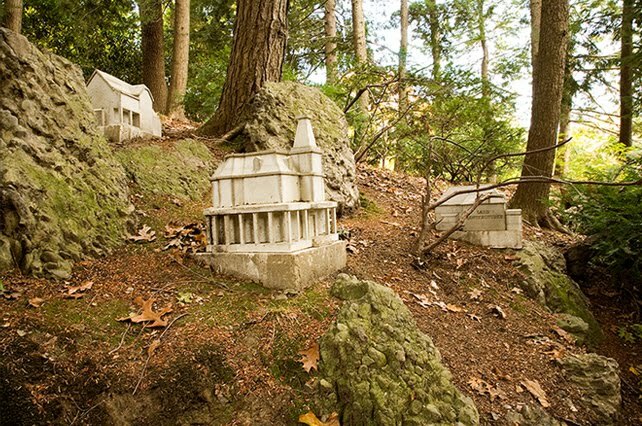 I chose to create boats for Forest Hills Cemetery because of their actual use in burial rites, such as those of the Egyptians and Vikings, and their presence in myth and folklore as vessels for the soul's journey after death. Boats also have rich associations with other container- coffins, cradles, seedpods, and husks. Artist Statement: This piece is a meditation on those we've lost, as experienced in the remnants of our memories. 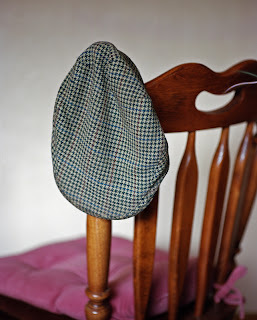 The garment-like form that is the basis of the piece could be a portrait of an individual. But outer layers of cloth obscure all recognizable detail. The figure loses specificity and becomes universal, as personal memory blurs into collective history. 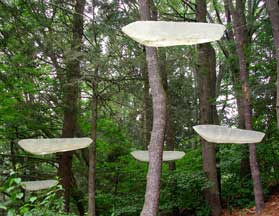 The earth-toned color connects the apparition to the ground; the effects of time and weather make it ethereal. It is sequestered in the woods, suspended between heaven and earth. 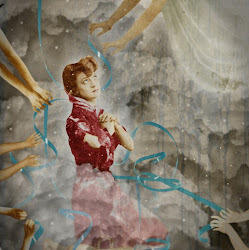 For the past decade I have been developing multi-media work about my family's history in Germany during the Holocaust. I emigrated with my parents when I was one year old, leaving behind grandparents and other relatives. Trying to come to grips with a loss that knows no generational bounds, I have been deeply concerned with memory and history. “Winner took inspiration from the grave markers of non-Christians, like the ones found in Mindanao for instance, that define burial sites with carved likenesses of the dead beneath them. 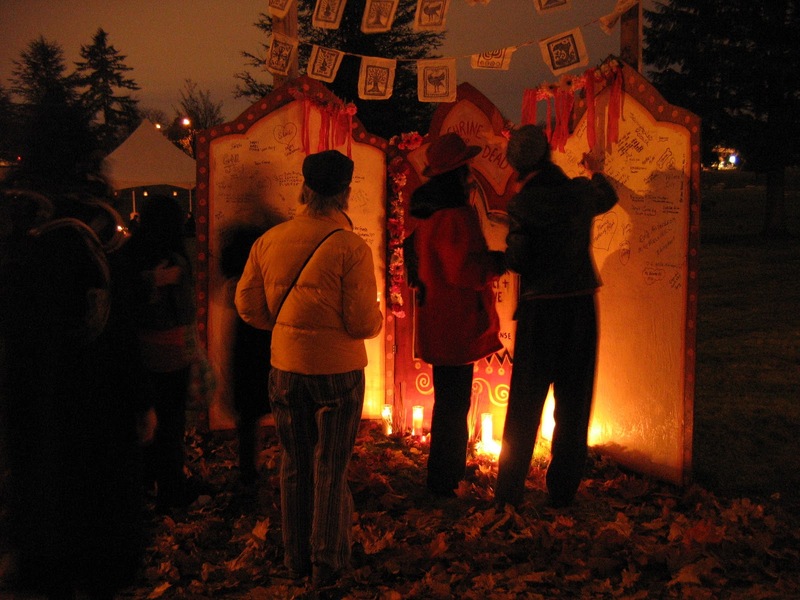 Some eastern religions also pay tribute to the deceased by keeping cherished objects close to them. Winner fabricated each piece as both a portrait and a still life, one on reverse sides of each other. He painted using automotive paint on a resin base. This allows the pieces to stand outdoors. 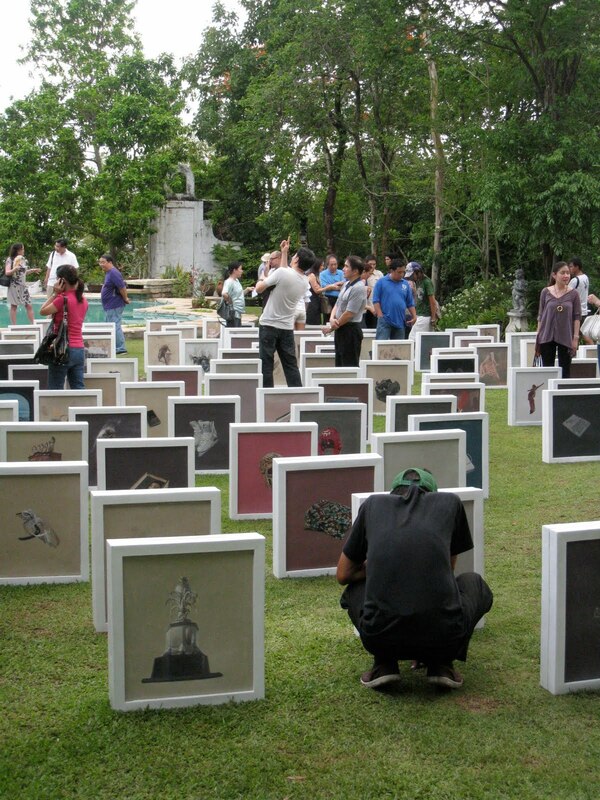 With the help of artist Ruel Caasi, he set up the exhibit to fill the grassy knoll by the gallery’s pool, all portraits facing one side, all the still lifes the opposite”. What is Mr. Jumalon telling us with this work? 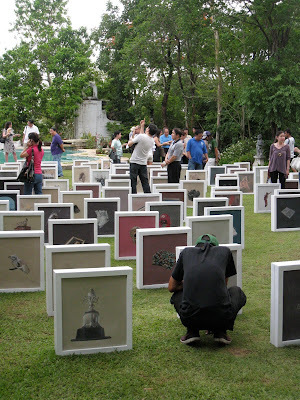 The exhibit is not in an actual cemetery, and the portraits on the front of the pieces are of living people, but the show is obviously set up to remind us of a cemetery. The visual of all these faces, individuals, with issues and concerns, and the reverse image, of all the physical objects belonging to these people, testament to their involvement in this world; these images will change the way I see a cemetery. When we look at a cemetery mostly we see the stone monuments. We are aware of what they represent, but we do not see the people. 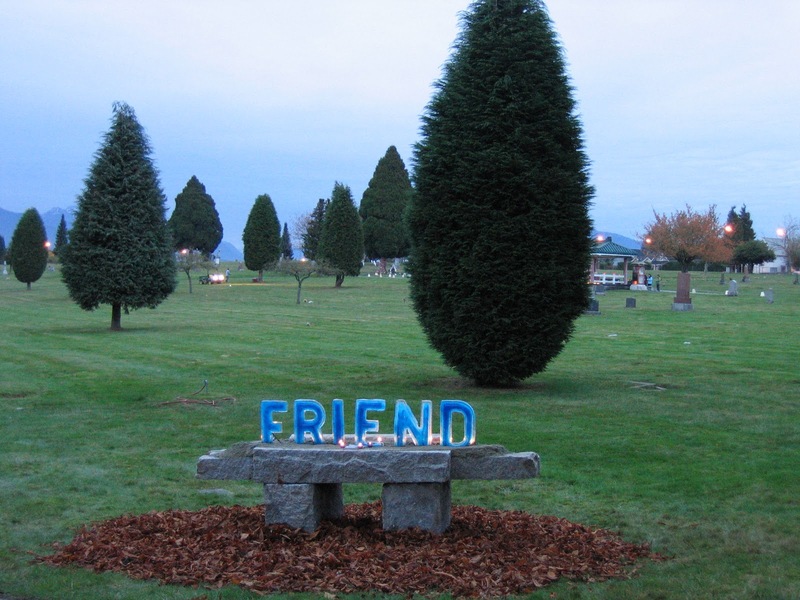 One important gift that art can bring to a cemetery or columbarium, is the reminder of the individuals; not just the people we remember, not just a number, but a sea of our forebears. Each an individual, each with his or her own unique contribution to the world we now inhabit. We accept this in our minds, but sometimes it takes art to help us to acknowledge it in our hearts.